This is an easy and decadent dish that could be an appetizer or a meal. 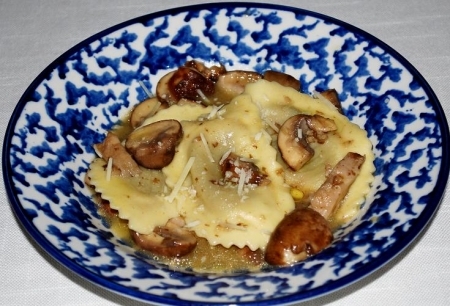 Buitoni brand Wild Mushroom Agnolotti Pasta with Wild Mushrooms is being used, but you could easily substitute it for your favorite ravioli or a different kind of pasta. Basically Agnolotti is stuffed pasta similar to ravioli, but has a slightly different shape. Shitake and cremini mushrooms are being used, but you can use an assortment of your favorite mushrooms. Serves 6 – 8 as an appetizer or 4 as a meal. In a large skillet add both oils and mushrooms and sauté over medium high heat until mushrooms start to release their liquid. Add garlic and sauté for about 30 seconds. Deglaze the pan with the white wine and add broth and cook for about 5 minutes to reduce sauce. Cook pasta according to package directions. Drain pasta, add to a bowl, spoon mushrooms and sauce over pasta, drizzle with a touch of truffle oil and top with a sprinkle of parmesan cheese. Serve and enjoy! Try Parducci Family Farmed Pinot Noir ( California), Bogle Vineyards Pinot Noir (Russian River Valley), Rodney Strong Pinot Noir (California) or Pedroncelli Pinot Noir (Russian River Valley, California).